BROWARD COUNTY, FLA. - Ocean RoRo carrier SC Lineconsolidates and reaffirms its USA Service commitment from Broward County&apos;s Port Everglades to Mexico, Panama, Colombia, and the Caribbean with the arrival of its new Roll On/Roll Off cargo ship, M/V Caroline Russ, to the South Florida seaport. Founded by the Sola Matas family in 2006, SC Line began operating at Port Everglades, FL, in 2012, servicing OEMs and the NVOCC community at large by transporting self propelled new & used vehicles, trucks, heavy equipment as well as project static cargo on mafi roll trailers from South Florida to Latin America and the Caribbean. "SC Line has a proven track record that includes reliable service and professionalism," said Port Everglades Deputy Director Glenn Wiltshire. "We appreciate their business and look forward to continued success with the Caroline Russ." The 10,488-gross-ton RO/RO ship sails every other Friday from Port Everglades beginning February 14. The ship has capacity for 190 trucks, 470 cars and 120 20-foot containers (TEUs) on chassis. Fast Terminal, the land based supply chain integrated services business unit of the SC Group,fast-terminal.com, operates at Port Everglades as the cargo handler and terminal operator for SC Line. Fast Terminal features a specialized RoRo terminal with several value added services for the port´s trade community such as VPC, EPC, FTZ and transit storage with a capacity of 1,100 bays. The latter earmarked and tailor-made with the OEM auto, truck and heavy equipment industry in mind. Thanks to its ocean liners weekly service and rail connectivity through the FEC, CSX, BNSF, NS, the terminal serves as an ideal OEM inventory transshipment & processing point of service for the SE United States, Caribbean, Central & Northern part of South America´s markets. The SC Line Group, founded in 2006, started its activities moving trucks between Mexican, Colombian, Panamanian and Peruvian ports with two major pillars: Reliability and attention to detail. In 2008, the group began a regular fortnightly RoRo service between Mexico and Colombia for the truck manufacturer Navistar/International. Superb performance on its itineraries, unfettered operational excellence, backed by a powerful cloud / android based information system quickly moved SC Line to the forefront of this trade on the Roll on Roll off segment in the Mexican Gulf area. With its young and fresh, dynamically adaptive management style, SC LINE earned the trust of major truck and auto manufacturers in the Americas. In the present day, SC Line is headquartered in Panama, featuring full commercial and operational offices in the United States, Colombia, Mexico and Venezuela. It is noteworthy that one of its business units, SC Chartering, has become an important carrier contributor by transporting oil and gas, wind power and renewable energy solutions to several projects in the Panama & Central America region. SC Line offers a very reliable transport service but it also delivers high quality products that have been awarded by current OEM senior executives who highlight SC Line&apos;s flexible and professional portfolio of services. At the crossroads of north-south and east-west trade, Broward County&apos;s Port Everglades is Florida&apos;s leading container port, handling more than one million TEUs (20-foot equivalent units, the industry standard measurement for container volumes) and serving as a gateway to Latin America, the Caribbean, Europe and Asia. Located within the cities of Fort Lauderdale, Hollywood, and Dania Beach, Florida, Port Everglades is in the heart of one of the world&apos;s largest consumer regions, including a constant flow of visitors and up to a combined 110 million residents and seasonal visitors within a 500-mile radius. Port Everglades has direct access to the interstate highway system and the newly opened 43-acre Florida East Coast Railway (FECR) intermodal hub, and is closer to the Atlantic Shipping Lanes than any other Southeastern U.S. port. Ongoing capital improvements and expansion will ensure that Port Everglades can continue to handle future growth in container traffic. A world-class cargo handling facility, Port Everglades serves as an ideal point of entry and departure for products shipped around the world. For more information, go to porteverglades.net or write toportevergladescargo@broward.org. 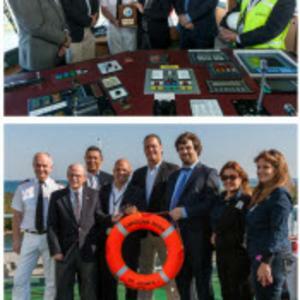 Top photo: On the bridge of the M/V Carolina Russ for the traditional plaque exchange ceremony (from left to right): Jean Elie, Assistant Director, Port Everglades Business Development Division; Jose Maria Sola, General Director, SC LINE; Capt. Adam Mis, M/V Carolina Russ; Glenn Wiltshire, Port Everglades Deputy Port Director; Ignacio Sola Matas, CEO, Fast Terminal and Farid E. Escobar, Trade Lane Manager, SC Line. Aboard the M/V Carolina Russ (from left to right): Capt. Adam Mis, M/V Carolina Russ; Glenn Wiltshire, Port Everglades Deputy Port Director; Jean Elie, Assistant Director, Port Everglades Business Development Division; Juan A. Williams, U.S. Branch Manager, SC Line; Jose Maria Sola, General Director, SC Line; Ignacio Sola Matas, CEO, Fast Terminal; Maria Isabel Ferreyra, SC Line, Commercial Department; and Yudith Lamorena, Fast Terminal, Operations Department.